Art work for the BCW has been signed off and production will commence shortly. We are currently waiting for a delivery date from the factory. We are also waiting for completed drawings for the BSV and these are expected within the next two weeks. Our new factory team has been hard at work and in the past week we received the pre-production sample of the first vehicle in our Stock Wagon Project - the Bogie Cattle Wagon or BCW. The sample is simple stunning. The level of detail has lead several reviewers to say that this is the best RTR model ever seen. This model depicts the last batch of 100 cattle vans converted from 1959-type sheep vans, utilising the original bogies, ends, roof and underframe. New sides were fabricated from standard cattle van components but there were two bars in the upper area to compensate for the extra height in the sides compared to the 1959-type BCW. 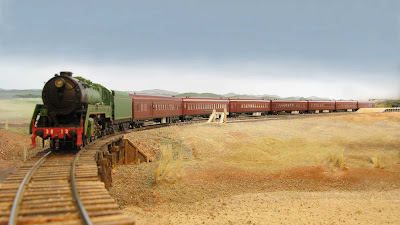 Bogies varied and Eureka is modelling the common 2AQ (AQA) type. 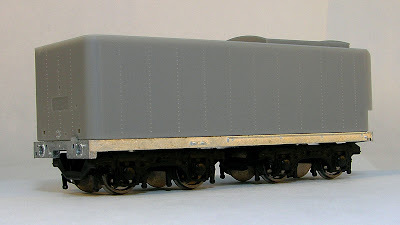 The wagons were introduced in 1974 in PTC blue which quickly faded and weathered to a light grey. Numbers were 30801 - 30900, coded BCW later NSCF and they were all out of service by the time that the railways ceased transporting cattle in 1989. Also received from the factory are the design drawings for the other vehicle in our Stock Wagon Project - the Bogie Sheep Van or BSV. Both models will be available in packs of three with delivery expected in early 2012. Order forms are available from Eureka and will be included with the next edition of The Eureka Times which is currently being prepared for a November post out. Five cubic metres of sound equipped CPH/CTHs were delivered today to the Eureka Offices and distribution has now commenced with the first orders going in tomorrow's post. As is the normal practice, those who have fully paid models on order will be contacted first to confirm order details after which the models will be put in the post. Anyone wishing to short-circuit this process can ring the Eureka office. For those who are interested in these things we have been advised that the Tian Yun He was not diverted to Melbourne. It sat off the Central Coast for three days because of port congestion. The Tian Yun He arrived at Port Botany last Sunday which was four days later than expected. Our freight forwarder believes that it was diverted to Melbourne first because of congestion at Port Botany. Consequently, we have been advised to expect delivery of the CPH/CTHs next Monday or Tuesday. Here is a larger picture than the one posted recently, just click on it for a better view. CPH/CTHs with sound on their way. In keeping with Eureka's policy of providing maximum information on its projects, the attached photo shows the Tian Yu He which has been chartered to carry the Eureka CPH/CTHs from Shenzhen to Port Botany. The last report that we have from the ship's captain is that the ship is in the South China Sea at position 22.11587/114.2729 heading for Port Botany at a steady speed of 9.5 knots on target for a 4 August arrival. R Class - The first complete sample. A couple of minor adjustments, the addition of sound and some artwork and the R class is ready to go into full production. I guess I should have mentioned that the cargo will include the sound equipped CPH/CTHs. One of the items brought back from the factory this week is a complete engineering sample of the "R" class. Complete in all details including smoke deflectors, the sample is currently being painted after under-going some exhaustive test running. Photos should be available on this blog over the coming weekend. MV Tian Yun He to sail from Hong Kong 25 July, arrive Port Botany 4 August, 2011. 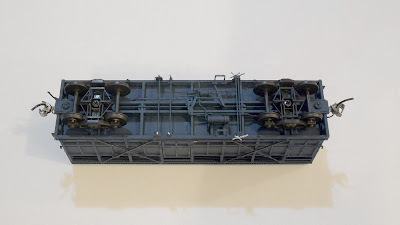 The test shots for the NSW Railways NTAF Bogie Tank Wagons have arrived. A couple of corrections have been raised with the factory and the next step will be the arrival of paint samples which are a little way off yet. The next test samples that are expected will be those of the HUB set due in late July. Just about there now but still no deflectors. Just about all of the injected components are now on hand and the model shown in the accompanying photo is the result. 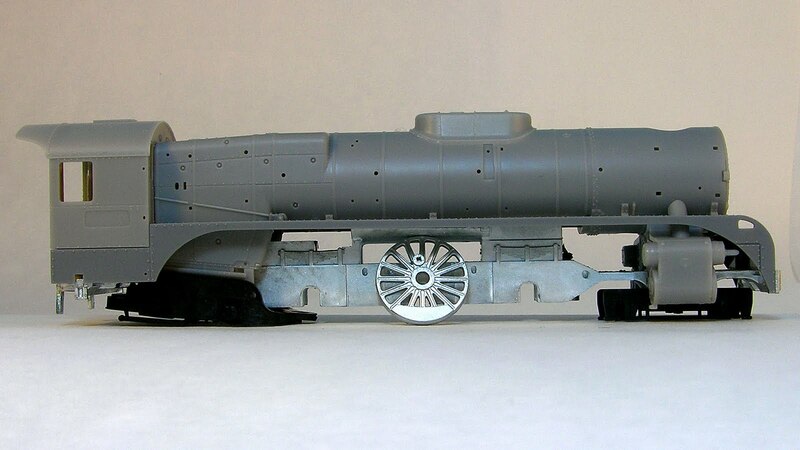 Still no smoke deflectors as these are etched components. Two minor corrections identified at this stage. The next step will be a running model which is expected in late July. Fun and Games at the Eureka Office. All those with R class locomotives on order have now been sent the K Class special offer letter. The next task for the hard working staff at the Eureka Office is to finish the next edition of "The Eureka Times" and to get it into the post. The next edition is almost written (as of the 9th of May) and post out should commence next week end (but no complaints please if it is held up). The printing and distribution of an edition of "The Eureka Times" takes about ten days and this one is being done in conjunction with the post out of the AD60s. One or two surprises in it. Persons with fully paid orders are being contacted first and to date approximately 10 % of orders have been posted out. The full post out is expected to take three to four weeks. AD60 - More Photos Courtesy of James McInerney. With the AD60 re-run having left the South China Sea on its way to Port Botany here are some more photos of the red lined and centenary liveries. Thanks James. AD60 Re-Run: The AD60 re-run is due in Port Botany on the 21st of April. Easter may slow clearance up a bit but we expect to receive the shipment by the 28th and delivery will commence shortly there after. The Brisbane exhibition will also interrupt proceedings a little so it will probably be the 3rd of May before posting out hits full swing. As usual everyone who has an order in for an AD60 will be contacted before their model is put in the post. Any outstanding balances should be paid now as orders with outstanding balances will be dealt with last. Posting out is expected to be completed by the end of May. The test shots received are not a complete set with a few important items such as the stack missing. Next step is a fully working engineering sample. For those who want a close up look the samples will be at the Hobson's Bay exhibition. "R Class test shots - Except that I have them in my hand I might not believe it" A not-quite full set of test shots for the R class arrived by air from the factory this morning. By mid-morning the bits were being assembled into a coal and an oil burner. Assembly is not as easy as you would expect as there are hundreds of parts some of which are still in their plastic bags as I have no idea what they are or where they go but the results certainly look like an R class. Photography is next and I will put some shots up here on the weekend. The next step is a fully operational engineering sample which we expect to receive from the factory in June. 6018 on trial before entering service. The re-run of our AD60 is due in Port Botany around the 14th of April. Numbers available are 6001, 6002, 6018 in lined red as above, 6015 in plain black and a small number of 6020 in Centenary colours. All are available with or without sound and the lined red versions are available with weathering. Photo: Ray Pilgrim. 10 units from the production run arrived by air today and the factory advises that they expect to ship the rest of the run on the 30th of March. This being the case, we should be able to clear them from customs at Port Botany around the 14th of April. I am arranging photographs and will put them up here when I have them. China returned to work last Monday after the Chinese New Year holiday break and in response to our emails information regarding deliveries is starting to filter back to us from our factories. 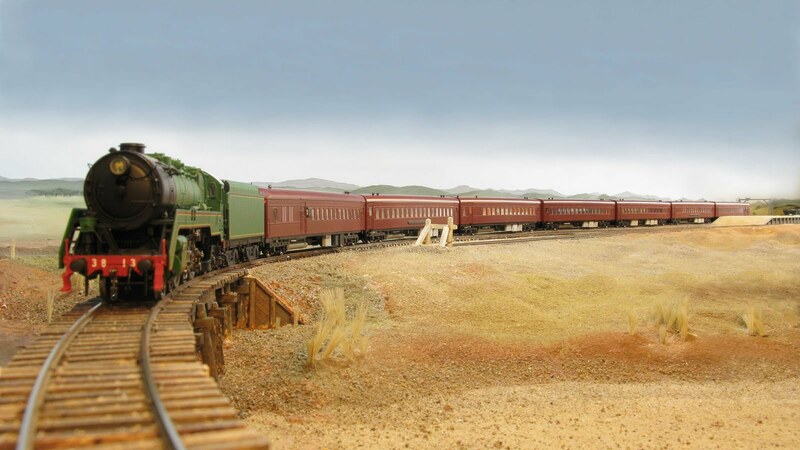 The first news received is from the old factory who have advised that assembly of the re-run of our AD60 class Garratt is underway and that dispatch should take place the last week in April which suggests a mid-May arrival at Port Botany. The first engineering samples for the E Wagon project arrived in the week prior to Chinese New Year. The samples are excellent. The detail is accurate and fine. 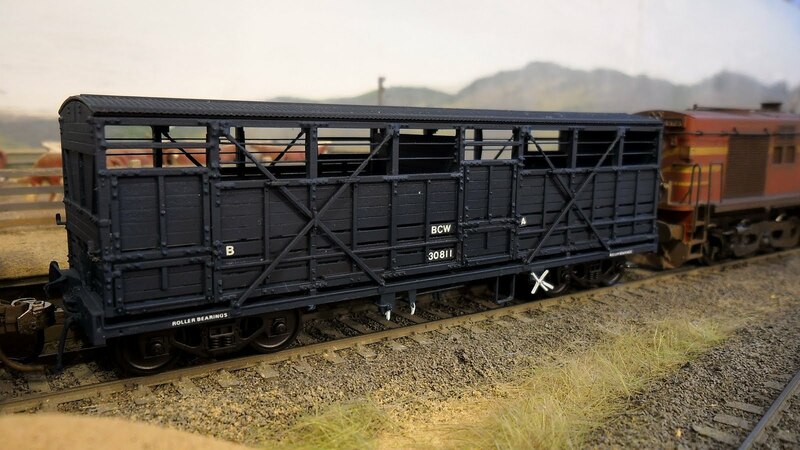 The interior detail on the open wagons is particularly impressive and provides a very nice view for those who like to run their wagons empty. The factory has stated that these are the first samples and that they will be making further improvements. At the same time the samples are being checked at this end for any necessary improvements or corrections. In November last year the factory advised that they expected to deliver the 1st samples in the week before Chinese New Year and this is precisely what they did. This is very promising for the dates that have been supplied by the factory for our other projects currently in the pipeline. The next steps will involve making any corrections that are necessary, preparing artwork and then proceeding to production.